The Mekong River is often depicted as originating in the Qinghai-Tibet Plateau. Maps show it flowing downstream through China’s southwest, and then forming the borders of or flowing through Laos, Myanmar and Thailand, before bisecting Cambodia and Vietnam’s Mekong Delta on its 4,500 kilometre journey from the Himalayas to the sea. However, the Mekong has another point of origin: the Tonle Sap Lake in Cambodia. Each year life springs from the lake, mostly in the form of a massive fish population that migrates to the far reaches of the Mekong system both upstream and downstream. This annual migration provides tens of millions of households throughout the Mekong Basin with regular protein. While the total catch from wild fisheries in all of North America’s lakes and rivers is 160,000 tons, each year the Mekong system produces 2.6 million tons. The Tonle Sap alone provides around 500,000 tons, comprising 75% of Cambodians’ protein intake, and making it the world’s largest freshwater fishery. But this rich resource is threatened by upstream dam construction, overfishing, unregulated agricultural practices and climate change. We recently published a report that explores the impact of human activities from a broader perspective. It offers alternative development pathways to optimise trade-offs between water, energy and food production. These approaches include basin-wide water and energy planning and a deeper incorporation of non-hydropower renewable energy sources into Cambodia’s future power mix. These approaches can avoid upstream fragmentation between the Tonle Sap and the rest of the Mekong system. This way, the monsoon pulse which each year reverses the direction of the river, draining the lake and sending 70 times more water, organic material and fish back into it, can be preserved. The annual flooding and draining of the lake acts as a heartbeat pumping life throughout the Mekong Basin. 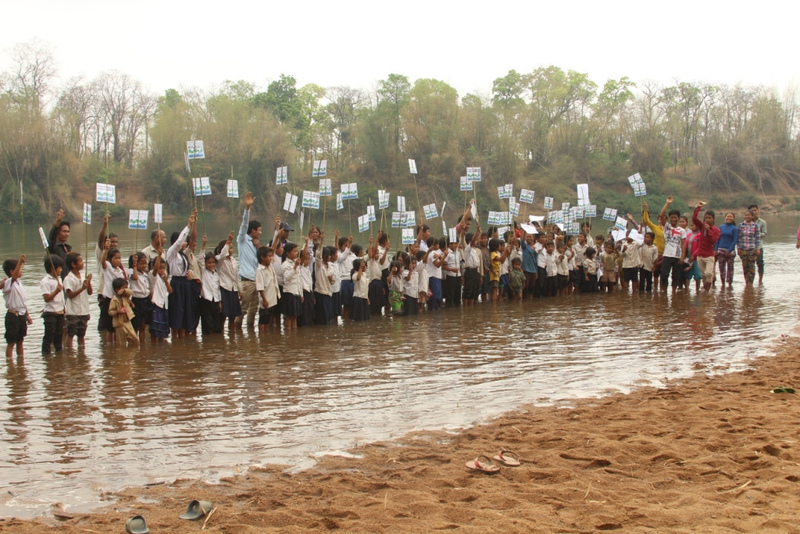 This process is threatened by the construction of and future plans for hydropower and irrigation dams upstream of the Tonle Sap in Cambodia, Laos, Vietnam and China. Dams and other built structures block or reduce flows in the Mekong, which reduces the amount of water, fish and nutrients going into the Tonle Sap each year and also constricts the ability of fish to find upstream habitats. In Cambodia alone, the connectivity of the country’s 11,000 kilometres of the Mekong/Tonle Sap river system has already been reduced by 31% by the construction of two hydropower dams and six irrigation reservoirs. One of those hydropower dams, the 400-megawatt Lower Sesan 2, located just below the confluence of the Sesan and Srepok rivers, cut off more than 3,300 kilometres of tributaries to the rest of the Mekong system and the Tonle Sap when it was completed in 2017. The fish ladders incorporated by the dam developer, Chinese state-owned enterprise Huaneng Hydrolancang, are unlikely to accommodate a meaningful quantity of fish in a system that is known to have as many as thirty tons swimming through in one hour during peak migration season. Further, even if some fish do make it past the ladders to spawn upstream, the eggs and fish larvae washed back downstream towards the Tonle Sap by the annual Mekong flood pulse will likely sink and perish behind the dam as the river slows on its approach. A 2013 peer-reviewed article by Guy Ziv and colleagues, which examined the impacts of tributary dams on the Mekong system, claims the Lower Sesan 2 dam will reduce the Mekong’s fish population by more than 9%. Our study finds that the Cambodian tributaries of the Mekong are being dammed one project at a time with no comprehensive plan. 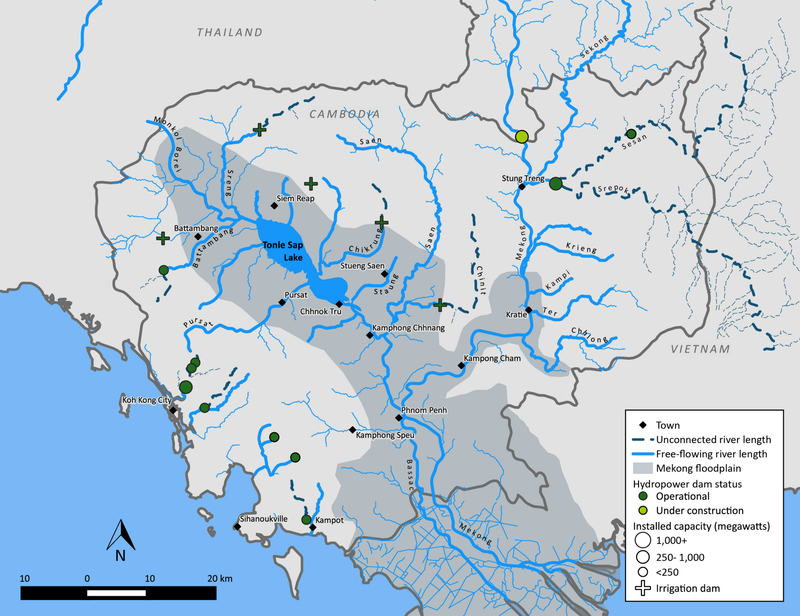 Damming tributaries (rather than the mainstream) could reduce connectivity between the Tonle Sap and the rest of the Mekong system by 60%. Further, building the controversial mainstream dams at Sambor and Stung Treng would effectively annihilate Tonle Sap connectivity, terminating the lake’s rhythm. Many of the dams in Cambodia’s inventory are poised for development through memoranda of understanding or concession agreements with Chinese dam developers. How these Chinese investments play out in the coming years could make or break Cambodia’s Mekong, the viability of the Tonle Sap and the tens of millions of people it supports. Only building dams in Cambodia’s portion of the Mekong Basin above the Lower Sesan 2 dam could be a pragmatic option that protects the Tonle Sap. Our study shows how this could result in the generation of more than 1,000 megawatts additional capacity whilst potentially having zero net effects on Tonle Sap connectivity and fisheries productivity compared to the status quo. However, such development should not be considered unless the resettlement needs of Cambodia’s upland and ethnic communities upstream of the Lower Sesan 2 dam can be met. Cambodia’s track record on resettlement is inadequate. Alternatively, the expansion of hydropower above the dam could be reduced or augmented by tapping into robust solar and wind endowments in Cambodia’s Mondulkiri and Ratanakiri provinces, or exploiting wind, solar and biomass capacity across the kingdom. Cambodia has some of the highest power prices in the whole of Southeast Asia, as high as USD 0.25 per kilowatt hour in urban areas, whereas rural residents have often paid more than USD 0.80. Much of the country still runs on diesel generators or imports power from Vietnam or Thailand. Pressures to lower electricity prices, which would spur economic development, have set Cambodia on new pathways to expand its power generation mix. The greatest opportunity for diversification of Cambodia’s energy mix and shifting away from over-development of hydropower lies in non-hydropower renewables. 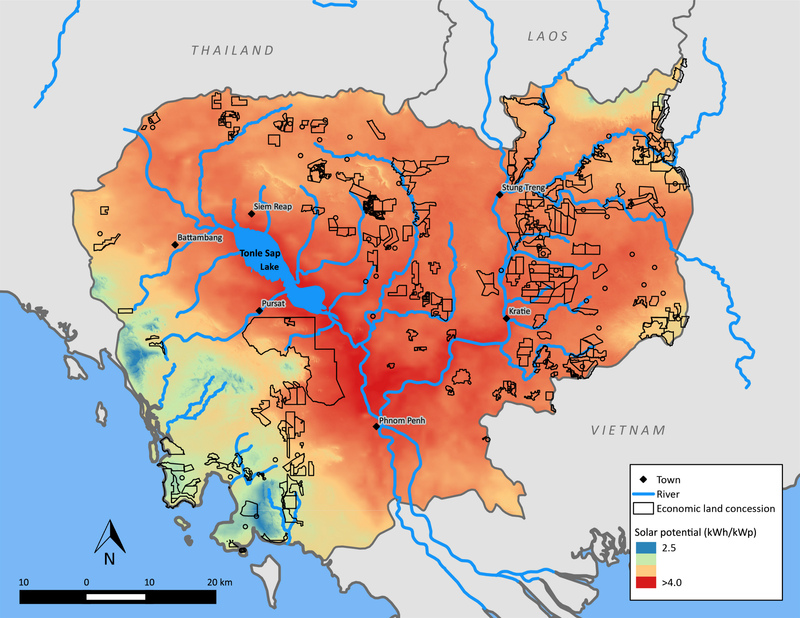 On 65% of Cambodia’s land, solar irradiation levels are above 1,800 kilowatt hours per square metre. This offers a total solar potential of 8,000 megawatts, which is significant given the country’s 10,000 megawatts of hydropower potential. Cambodia’s wind potential could be as high as 6,500 megawatts according to an Asian Development Bank study. In 2017, the Asian Development Bank announced its support for the first 10 megawatt commercial-scale solar farm in Cambodia and then continued in June 2018 with the announcement of a 100 megawatt solar farm tender. Since then solar investment has become a hot topic. In January 2019, Prime Minister Hun Sen visited Beijing and met with the dam developer Huaneng Hydrolancang. Instead of signing agreements for new hydropower projects, he inked deals for solar power. While Cambodia has yet to set hard targets for solar development, new regulations and guidelines provide clarity for investors. For example, heavy consumers such as large apartment buildings, factories and other large compounds can install solar (above five megawatts) while maintaining connections to Cambodia’s national grid. The Chip Mong Insee cement factory in Kampot recently became installed 9.8 megawatts of solar across its rooftops and in floating solar installations on its property. Cambodia’s sole utility company, Electricity du Cambodge, is also moving toward the purchase of solar power from private producers. This could lead to high levels of distributed generation across the country and encourage individual investments in solar. Development of a National Environmental Code is also expected to support household solar systems and provide tax breaks for companies that utilise solar power. Aside from regulation, the major challenge to developing more solar power is land. Issuing “economic land concessions” to foreign developers, most of them Chinese, has long been tied to land grabbing efforts. Some of these land concessions have been revoked due to lack of development and the government’s redistribution processes, others still lie fallow because of low agricultural commodity prices in recent years. A portion of these deserted concessions, if properly utilised, could be used for solar farms, especially those close to areas of high demand. The map below shows that most land concessions are within the areas that receive the high solar radiation favourable to solar photovoltaic deployment. With the help of foreign investors and development partners, most countries in the Mekong region are considering a greater role for solar and other non-hydro renewables. While the importance of renewables in reducing carbon emissions is increasingly understood, the role that non-hydro renewables can play in improving ecosystem services, and the availability of natural resources such as water and freshwater fish catches, is still undervalued. 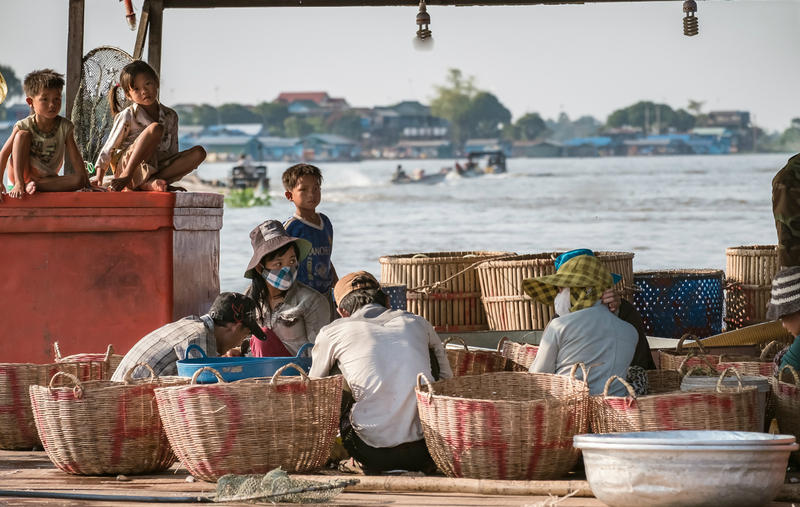 Our report demonstrates how Cambodia can develop its power sector with a basin-wide vision that not only conserves the fisheries of the Tonle Sap Lake but also provides a pathway for the country to rise as a leader in sustainability and conservation efforts.